The cost of making a candle continues to rise and the profit margin is shrinking. It gets harder to charge higher prices, to cover your costs, when the box stores are charging so very little for cheap, Chinese candles. It is important to save money in every way you can. One of the best ways is to re-use your left over candle wicks. 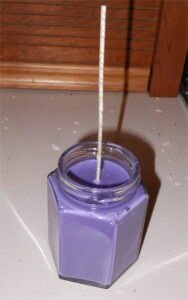 It is pretty common to have a length of wick that needs to be trimmed, after you've poured your candle. Wick tabs can be purchased in small packs or by the pound. It is more cost effective if you buy them by the pound, but it depends on how many candles you make in a year. Sometimes you can get by with a smaller number. Your wick tab size should be determined by the type of candle you are making. 20 mm is the standard size. 15 mm is for tealight size, or very small candles. 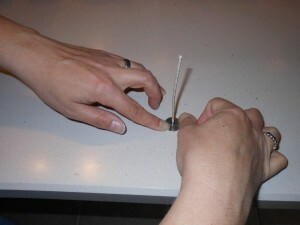 Begin by placing the wick into the tab. 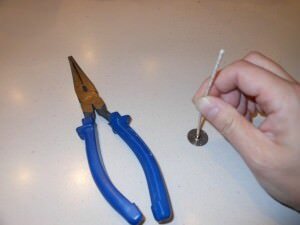 This is easiest if you have the tab directly on a flat surface, you can then "feel" if the wick is all the way to the base of the tab. 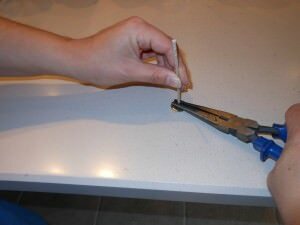 Next, squeeze the stand-pipe of the wick tab until it is firmly pinched the wick. Be sure you don't squeeze the wick out of the tab. It needs to be compressed firmly. If you have arthritic hands, this can hurt your hands, so be careful. Next, take and flatten the tab, as much as possible. It is soft metal and will bend easily. The flatter, the easier it will go into the jar, but a wick sticker will help make up for any issues. That's it! You now have a brand new wick and you are ready for your next container. For our candles, we use the HTP 1212 wicks and we can generally get 2 jars and a tin out of one wick. That is 3 containers for the price of a single wick, which takes the cost down to pennies! Hello, I have candles that are approx. 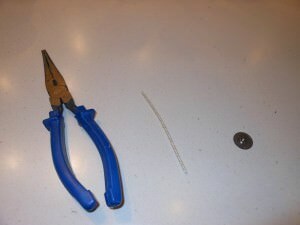 2 inches in size, round and have a copper wick tab in the shape of a long strip pulled together and prongs at the end. Have you ever heard of such a wick tab? CierraCandles Admin: We've seen aluminum tabs that sort of fit this description, but not copper. I would be concerned the copper might react with some fragrances, or oxide and leave streaking in the candle. Not sure though, none of us have seen these, very sorry!